"Just when I thought I was out, they pull me back in." It's a line uttered by Michael Corleone (Al Pacino) finding out that he's been wrangled back into the mafia lifestyle. However, it very well may be the motto for director Francis Ford Coppola and writer Mario Puzo, who decided to make The Godfather Part III following what can easily be seen as the franchise's main motivation: Coppola's other failing films. Following the box office failure of One From the Heart, he return to the beloved gangster franchise for a film that even he felt was unnecessary. It seems like almost everyone else feels the same way, as it has become considered a train wreck of a movie; a disgrace to the franchise. In the case of its 25th anniversary, it's time to consider one thing: it's actually good. Maybe not as good as its Best Picture-winning counterparts, but it's still not worthy of its problematic reputation. To put it bluntly, The Godfather Part III was doomed to fail since the beginning. When the studios attempted to bank off of the franchise following The Godfather Part II's Best Picture win at The Academy Awards, things were proving impossible to get another film off of the ground. Beyond the fact that Coppola, in keeping with his attitudes before, refused to make it. As a result, a dozen scripts were written that featured the Corleone family in some state of international struggle, including one involving Fidel Castro. There was even talks of Eddie Murphy starring in one. When Coppola returned with Puzo, the results weren't pretty. While not a major problem, Paramount Studio's choice to not name the film The Death of Michael Corleone (as Coppola intended) was only the start. The studio notoriously cut back on preparation, meaning that the script had to be done in six weeks as opposed to six months - all to meet a Christmas 1990 deadline. Add in the notorious drop-out of Winona Ryder and the absence of Tom Hagen (Robert Duvall refused to return following the studio's refusal to pay him the requested salary), and the film was already facing hurdles. The biggest issue with The Godfather Part III is that it's inessential. Even Coppola has claimed that the 1972 and 1974 films did a fantastic job of wrapping up Michael Corleone's legacy. There was nothing left to say and for 15 years, he claimed that he wouldn't do it. However, money was the issue, as had become the custom by this point. The Godfather was made mostly to cover money lost making THX 1138. The Godfather Part II was made despite Coppola's conflicted relationship with the studio. The Godfather Part III can be seen as being the most cynical of the three, as the director never held back his feelings of its lacking necessity. For whatever reason, The Godfather Part III was to be an epilogue to the story, showing the backlash to Michael Corleones' legacy. What made the final cut is essentially a cut and paste version of the first two's highlights; only with bigger set pieces and a subplot regarding Pope John Paul I's murder in 1978. Considering the lack of necessity, there's one thing that is astounding about the film. Besides the script problems, Coppola's direction was inevitably just as ambitious as ever before. The opening half hour in which Michael attends a celebration party perfectly sets up the missing pieces, even featuring a pre-Reservoir Dogs ear injury. The characters circle through the party, occasionally singing songs. The direction is fluid and Coppola still knows how to capture the small moments, dropping in on various parties that will later become more important. While a little overlong, it still has the visual narration in spades that made the first two so iconic. While everything after may be more problematic, the choice to start the film with a party almost feels required. It also helps that cinematographer Gordon Willis returns after his beautiful work on the sequel, adding a rich visual tone that makes it look just as iconic as the previous ones. Of course, there's Pacino - who is possibly a controversial actor nowadays simply by his reputation for doing hacky work. Even if The Godfather films are iconic, Pacino doesn't have the best reputation for subtlety following his early days. There's no denying that 1970's Pacino is better than 1990's Pacino. There are scenes in The Godfather Part III that show his inability to hold attention like he used to. Still, he's a very compelling presence whose only major fault is his graying hair and his occasional penchant for bad sweaters. His arc may be the only thing about the film that isn't problematic. The aforementioned pope murders and the uncomfortable relationship between kissing cousins Vincent Corleone (Andy Garcia) and Mary Corleone (Sofia Coppola) both eat up a lot of unnecessary time. If there's one intimidating fault to making a Godfather sequel, it's attempting to match a length of over three hours. 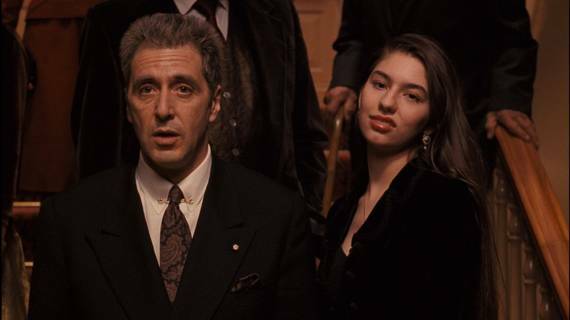 While The Godfather Part III is the shortest, it still has the grand, epic scope of the first two. Of course, there's the elephant in the room by which The Godfather Part III is most synonymous with: Sofia Coppola as Mary. For starters, Mary's character is awful and her relationship with Vincent never feels as romantic as the film tries to depict. It's essentially an attempt to be Michael's relationship with Kay Adams Michelson (Diane Keaton) from the first film, even with lines insinuating the famous "Don't ask me about my business." scene. It's one of the many ways that the film attempts to explore legacy and similarities between new and old generations. The only difference is that while Michael and Kay were from different backgrounds, Vincent and Mary were from the same family. The would even go so far as to constantly reference their cousin love. By the time that Vincent gets his big line with "Love somebody else," it doesn't work because of how much the relationship lacks a deeper romance. If anything else, the film does an excellent job of showing the vapidness of young love - which is something that the franchise had failed to do prior to this film. Even during filming, the press enjoyed insulting Francis Ford Coppola for the nepotism casting after main choice Winona Ryder backed out. Sofia, then 19, wasn't even an actress and believed that it took away from her ongoing education. Her reputation was later proven right, as a test screening forced her to redub most of her lines following conflicts over attempting to do a Valley Girl accent and properly pronouncing the word "Corleone." She wasn't great. Nobody could mistake that her acting wasn't the reason that her tragic death felt comical. She would win a Razzie Award for her performance, even breaking a record within the bad movie award's history with the highest single percentage vote with 65%. Her luck wasn't much better, as she later appeared in Star Wars: The Phantom Menace - albeit in a smaller role. Much like her father's feelings on the film in general, she didn't even feel that she was right for the role. It doesn't help that 1990 was also a turning point in gangster movie culture, with another film connected to The Godfather Part III with an unlikely actress. The elderly Catherine Scorsese appeared in a scene complaining to Vincent about the poor care of the neighborhood. While not significant, it connects her to a more revered film from earlier that year: GoodFellas, of which was directed by her son Martin Scorsese. Considering that Scorsese was initially going to direct The Godfather Part II (by Coppola's wishes) in 1973 following Mean Streets, this sudden head-to-head felt even more ironic. To generations now, Goodfellas is iconic and reflects a more compelling and gritty side to mafia culture. In a sense, The Godfather Part III and the aging Michael Corleone reflected a dying formula that couldn't sustain Goodfella's younger and faster pacing. Who knows how differently the observation would be had Coppola and Puzo had the chance to make The Godfather Part III to their liking. Still, the studio interference reflected the downside of the film. Both inevitably lost Best Picture at The Oscars and it didn't take long for history to show which was better. Even Joe Mantegna, who starred as Joey Zasa in The Godfather Part III, quipped on The Simpsons that "I haven't cried like this since I paid to see The Godfather III." Even if the film is largely a punchline, there is a certain fire that runs throughout the film. Yes, Sofia Coppola's casting is largely a sore spot. Yes, the rushed pre-production did more harm than good. Even the general sense by everyone involved that the film wasn't necessary hurts the film's reputation. But there's something to the magic that Francis Ford Coppola brings to the film, given that it was completed within a year of start. The cinematography is gorgeous and Coppola's reliance on visual direction remains a strong point. The way that information is conveyed is in keeping with the previous entries. The famous "oranges as a metaphor for death" is also present. Yes, there's moments that seem a little ridiculous - specifically in which helicopters gun down a board meeting. But they all feel fitting into this world where everything needs to be bigger and faster. What is arguably the best part of the film comes before the consensus' worst part. As the film wraps to a close, the Corleone family attends an opera. In a moment that mirrors the baptism scene from The Godfather (Sofia Coppola played the baby in that film), the murders of the pope and various other officials happens to the sound of operatic Italian music. The imagery is vibrant. The cross-editing is phenomenal. It's a perfect encapsulation of what the series does, saving the final bloodbath for one powerful moment. By the time that the opera ends, a wave of destruction is over, and everyone heads to the lobby. Even if the film lulls for half of the running time, there's something kinetic and straightforward about this scene. Even the few misdirects in which Michael looks to be killed next keeps audiences on the edge of their seat. 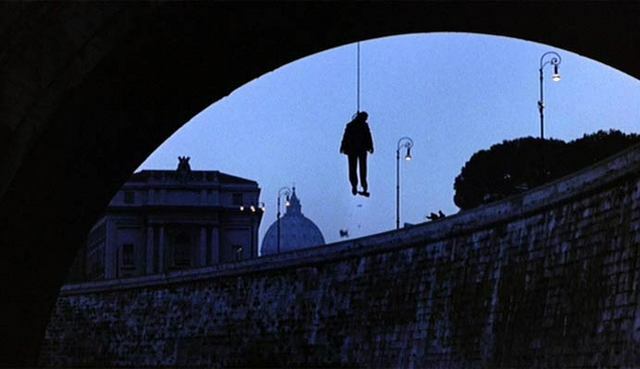 It's tragic yet beautiful to see a hanging corpse in silhouette underneath a bridge. This is the art that Coppola mastered in the first two. The only issue is that this precedes Mary's death, and Michael's even more anticlimactic one - in which it looks more like he fell asleep in a chair than died heroically. After that, the film just ends, almost as if it's unsure how to say goodbye. Maybe the issue is that there's a lot to be frustrated about. There's definitely a lot more than the first two combined. However, the fact that Coppola didn't phone it in is even more impressive. Even if the new characters aren't all that great, this does feel like an attempt to show an ironic version of The Godfather, where Michael sees the world from Vito Corleone's perspective. The younger generation is more brash and stupid than he is. Considering that Vito's ethics were even stricter, it feels more like catharsis for the actions portrayed in The Godfather Part II. Vincent is not a great leader, though that may largely be the point. It doesn't help that Andy Garcia's career hasn't gone the way of Al Pacino, but the idea of continuing the legacy from the next generation isn't an awful idea. Considering that a proposed The Godfather Part IV was actually Coppola's idea (and not a means for money recouping), who knows how things would have turned out. However, that project met its end when Puzo died in 1999. Still, there's something to experiencing the once spry Michael meet the ironic fate of his actions. Even with cyclical images, Coppola manages to create a vision that attempts to capture themes ranging from politics to aging. Michael is a frail man, and it may be a little much to see him in and out of the hospital. However, if there had to be an epilogue, Coppola at least found a story that could have levity. In a perfect world, Paramount would've given everyone more time and maybe the film would be the masterpiece. Maybe it would have only been as good as this. Coppola's even noted his personal regrets for the rushed feeling of the film. Even then, it's an impressive mixture of great ideas clashing with missing forethought. It's by no means a great sequel, but most trilogies look far worse by this point. Even if the film never got the same preferential treatment as its predecessors (even the great 2008 Coppola Restoration failed to update this film), it at least got a nice send-off. It broke the box office record for opening on Christmas Weekend. It received seven Oscars, though how much of that was sheer reverence? The Godfather Part III is a film of conundrums, both great and confusing. It's missed opportunities alongside bold choices. Even if it drags a little and features unnecessary characters, Coppola manages to steer it all into a story that is best seen as the ironic Godfather film. To some, that is an insult. To those who think that Michael Corleone was deserving of a fate worse than Kay's abortion, this film holds a lot of catharsis. Even if it's flawed, it's a beautiful and ambitious film that reflects how studio interference can ruin things. Even then, the film has a lot of high notes scattered throughout, and they're all worthy of attention. Maybe the film is not essential at all, but at least it's not awful. Most people who do films for money like this don't care enough to make something compelling. At least Coppola tried in an unreasonable world, and that may be enough worthy of applause.